Navigating legal issues in families can be difficult and confusing. How can you best prepare for the financial, health care, and care needs of loved ones as they age? How can you get help paying for long-term care? What is a power of attorney? What is the difference between a will and a living trust? What are the key documents that families should have? 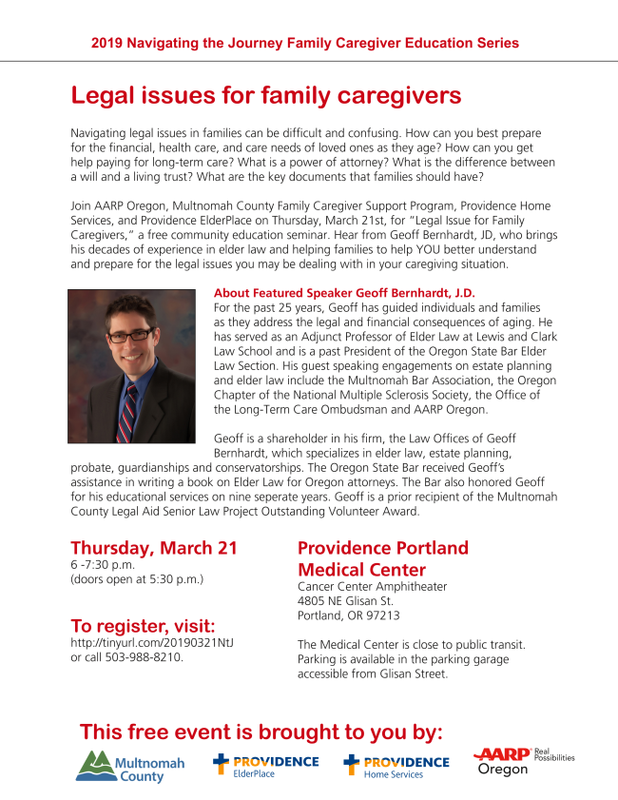 Join AARP Oregon, Multnomah County Family Caregiver Support Program, Providence Home Services, and Providence ElderPlace on Thursday, March 21st, for “Legal Issue for Family Caregivers,” a free community education forum. Hear from Geoff Bernhardt, JD, who brings his decades of experience in elder law and helping families to help YOU better understand and prepare for the legal issues you may be dealing with in your caregiving situation.